We are celebrating the holidays today – the Fourth of July holiday, that is! Matt and Cristina had a patriotic holiday weekend wedding in Maryland out on Breton Bay when the they tied the knot on the 4th of July in a red, navy, and white inspired celebration. 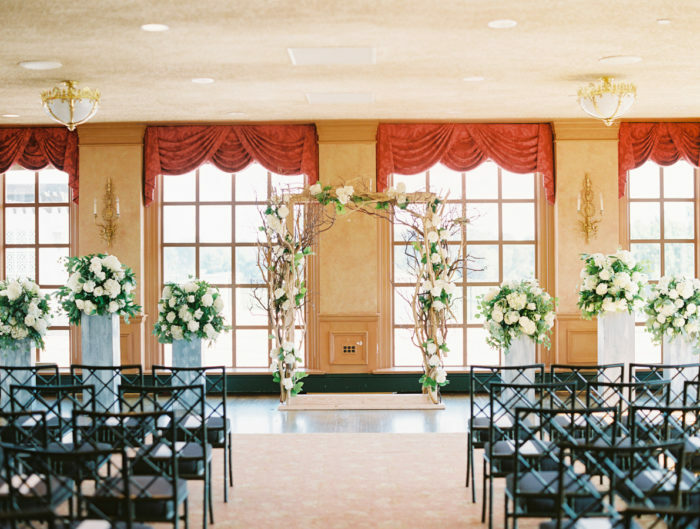 Their stunning wedding ceremony was held at St. Joseph Morganza in St. Mary’s County, before guests moved to a private home to celebrate their wedding reception (complete with a fully decorated golf cart for transport!). 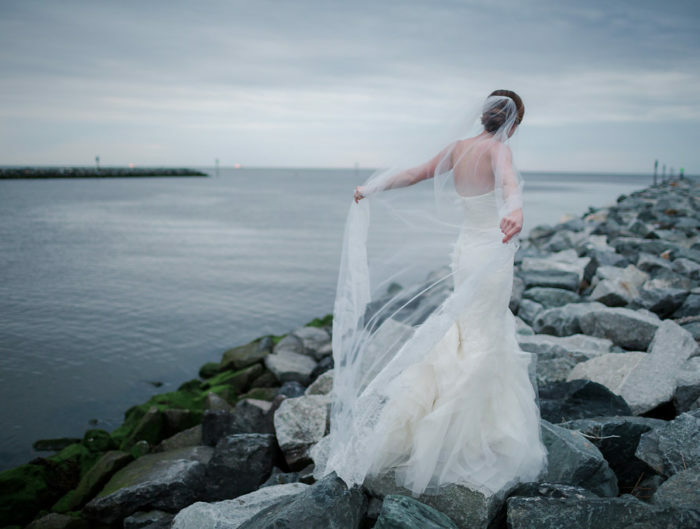 Their wedding was nautical in theme, which you know we love here by the Chesapeake Bay, but it is also because the pair met on a boat, naturally! And about a year after that, Matt proposed to his bride on that very same water, so it was only fitting that there would be boats and details to match on this big day! I’m obsessed with the boat table numbers, which are so much more than table numbers, and the life raft chair details to add that extra special touch! 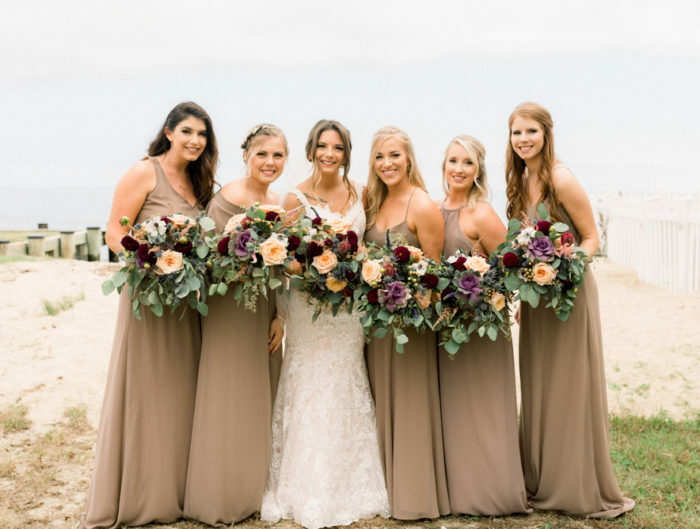 Their Maryland wedding has too many amazing details to count – and many of them were handmade with the help of friends and family. The pair kept it personal on this big day, even asking their wedding guests to contribute pies, just like their family tradition of a cake decorating contest on the 4th of July. What a fun way to enjoy a wedding dessert! A big thanks to Rachael Foster Photography for sharing Cristina and Matt’s 4th of July Washington DC area wedding with us! From the bride: My cousin works with Matt and brought him down to “camp,” our family’s home on Breton Bay in Maryland, and we met on a sailboat. When I missed the departure time for the sail, my dad drove me out on a jet ski, and I boarded while they were already underway! A little more than a year later, Matt proposed on a sailboat in the very waters where we met, so I knew almost immediately our wedding would have a sailboat and nautical theme. Our wedding colors were navy, coral, and white, and the wedding reception took place on my family’s property in Maryland. We both come from the very large families, so our biggest wedding priority was getting as many people to our wedding as we could. Having lots of great wasn’t great for wedding budget, considering just about every wedding website tells you that the best way to cut wedding costs is to cut your guest list, but this was just not an option for us. We also knew that we just wanted it to be fun at our wedding! We didn’t want to get caught up in the details or stress too much about our wedding being “perfect.” The things that were definitely on our wedding “must-have” list were a live band, a full bar, and transportation for our wedding guests. I love to craft and sew in my spare time, and the wedding gave me a great reason to get to work. I had lots of help, especially from my mom (and Pinterest!! ), and we started very early on with the save the dates, which a cousin later remade into a wedding cake for us. During the wedding ceremony, my two oldest sisters placed the “mantilla” over our shoulders, a Cuban tradition, to honor our mother’s birthplace and heritage. Our favorite wedding memories from they day were that we borrowed a cousin’s antique, cherry red, Triumph TR3 as our wedding get-away car to go from the church to the reception. This two seater, convertible (Thankfully the weather held out!) was such a fun way to have a few moments alone in an otherwise very busy day. We also loved the fireworks display at the end of the day; it was a great finale! Other major DIY wedding projects were the knot napkin rings, the origami sailboat table assignment cards, the bunting for the tent, the hotel guest bags (and several of the things inside the bag too! ), the table numbers on top of the (store bought) sailboat centerpieces), and some decorative buoys. So many people offered and did help in order to pull the whole wedding day off for us. From my aunt who gathered the fabric for the bunting in the tent from random Goodwill stores, to my cousins who hammered the signs all over the property into the ground, to the dear family friends who were able to pick up our table flowers the morning of the wedding while everyone was getting their hair and makeup done. I think people like to feel involved, so when they offered to help, I definitely took them up on it! It is so true what they say about weddings – having all of the people that you love in one area at the same time is an incredibly special and cool thing. We are so grateful to have experienced it. And, so grateful that our photographer, Rachael, captured our wedding so well! My family normally does a Fourth of July cake decorating contest, so we asked our family members if they would do the same for our wedding. There were so many beautiful cakes, pies, and cupcakes for our wedding reception dessert. Actually, we ordered two back up cakes (just in case the homemade treats wouldn’t fill up 300 guests! ), but in the craziness of the day before the wedding we just plum forgot to pick the cakes up! Since the 4th was a holiday and they were closed, I hope someone else enjoyed those two cakes! To save money on wedding things, look outside traditional wedding vendors. We used an Amish flower grower, who was more than reasonable for our wedding day flowers. Also, really try not to stress about having your wedding be “the best.” As an engaged friend going through all this stuff right now said to me (and I couldn’t agree more! ): sometimes good enough is good enough! It is way more fun if you pick the things that matter to you for your wedding, and then the other things, pick the “good enough” option. For example, one color in your letterpress wedding invitations is good enough! Two wine options is good enough. There are countless examples where the wedding choices are just good enough! Finally, take people up on their offer to help with your wedding! I found that there were certain wedding related tasks that just seemed so tedious, even though they were actually really simple. When someone would call and say “What can I help with?,” I would ask if they could take those programs on, which they almost certainly would, and would do so easily and happily! I love the colors and details. Such beautiful wedding photos.